Started as latenight-soldering experiment a new compositional strategy was conceived: in the borderlands of circuit bending and physical computing, I managed to overtake control of a miniature rc-helicopter using Max on my computer. This made it possible to use a microphone signal and extract certain sound features for controlling the helicopter through instrumental playing. 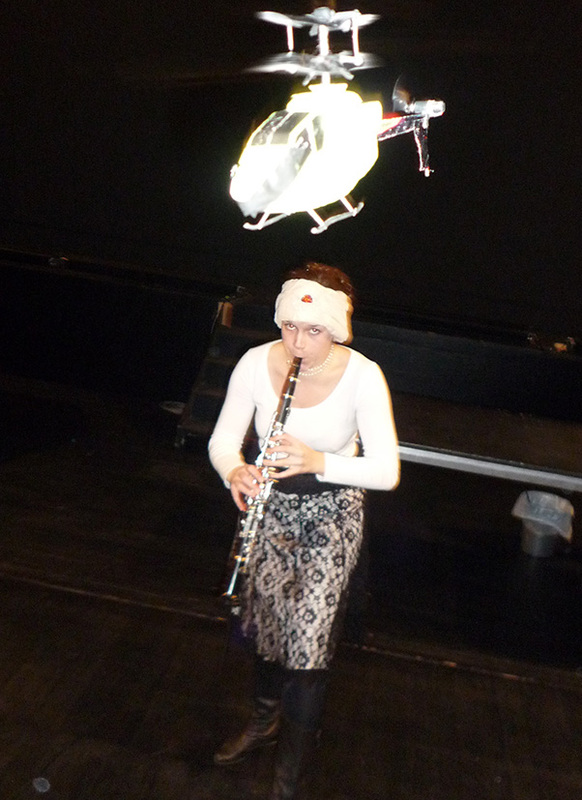 The primary task of the pilot Carola Schaal is to achieve maximum air-time using her clarinet. There is no choice but to follow the instructions given by flying gadget in order to avoid crashing, the music is created as a result. A newly developed hardware configuration will be premiered at 48h-Wilhelmsburg festival.